Due to popular demand, we are thrilled to announce that the 10th Anniversary Edition of Susan's Autumn book has been re- printed. Every book ordered here on Susan's website will be shipped from the Studio in California bearing Susan's original (each individually signed) signature. 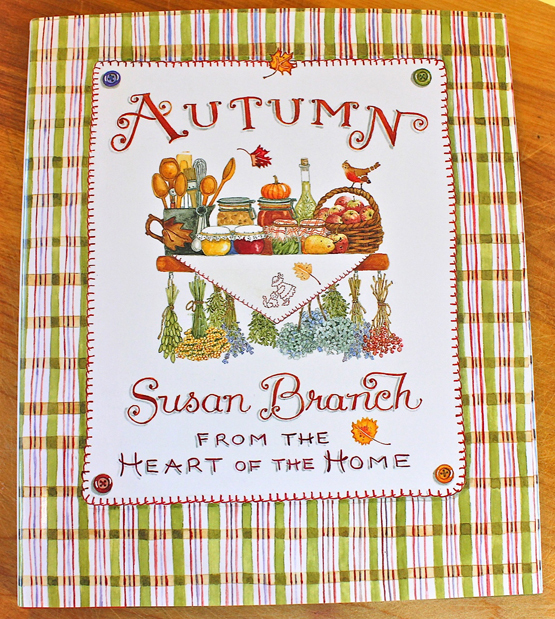 AUTUMN from the Heart of the Home has become a classic ~ it's hand-written and watercolored in Susan's light-hearted and romantic style. This "homemade" book celebrates the many joys of Autumn with Susan's delicious easy-to-make, casually elegant recipes such as Cinnamon Ice Cream, Pear Tatin, Harvest Stew, Sweet Potato Casserole, Cranberry Apple Crisp, Red Chili Onion Rings, Pumpkin Cheesecake and many more. You will feel the Autumn breezes and see colorful leaves falling on her pages when Susan shares her insights in stories such as "Afternoon Tea," "The Autumn Table," her vintage New England home on the magical island of Martha's Vineyard in "My House," playing outside in "Sweater Weather," walks in the woods with "Morning Science," and decorating "The Guest Room" for holiday visitors. There are also wonderful quotes, traditions, and crafts ~ and what would any self-respecting Autumn book be without lots of easy ideas and menus for Halloween and Thanksgiving! Every good thing about this wonderful season is in this 128-page, full-color book, including the special touch of a sewn-in grosgrain ribbon bookmark.